Removable Aluminum alloy Toilet Chair is a removable folding aluminum commode chair. 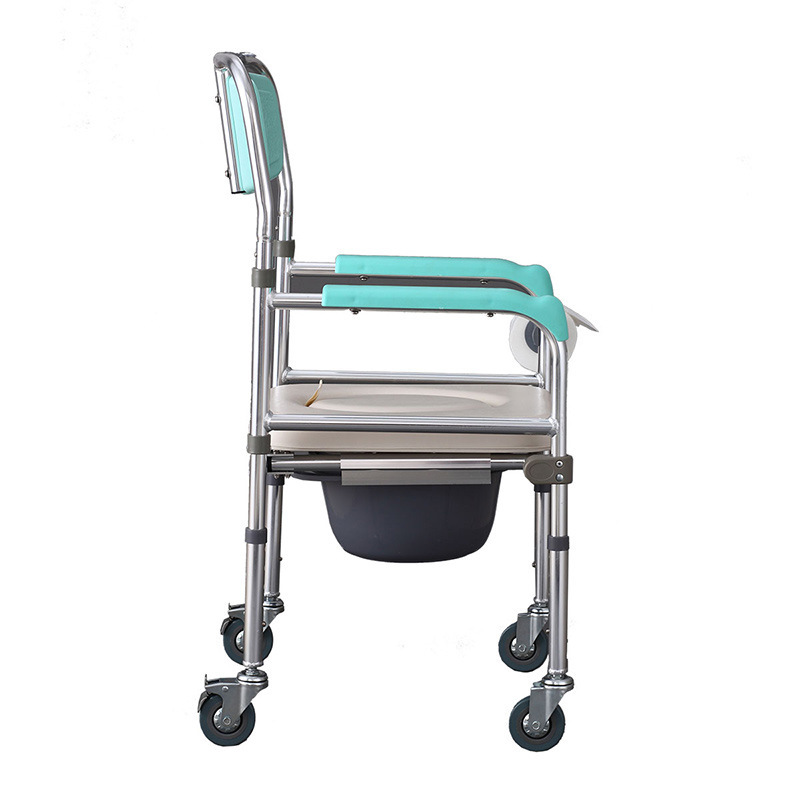 The wheeled design is especially suitable for the elderly. Both rear wheels are equipped with foot brakes. When pushing, the foot brakes are up, and when the foot brakes are down, they are unable to slide. The commode can be pumped before and after, and the commode can be increased without leaking urine and preventing odor. Can be mentioned. Soft cushions effectively relieve constipation. Double reinforcing rod, high load capacity 360 kg. Take a bath and take a walk, and use a chair. Installation and folding are more convenient without tools. Aluminum alloy, bearing weight up to 360 kg. PU soft cushion, thickened and widened, not buttocks, easy to clean, a clean and clean. The overall is strong and comfortable. Usually can be used as a sofa chair, even if placed in the living room, it is completely invisible to be a toilet seat, practical and beautiful. The soft seat cushion effectively relieves constipation, and also makes a bath and a toilet. 360-degree all-round leakage prevention, the biggest relief from the trouble of cleaning. Newly upgraded aluminum alloy bold flat tube series. 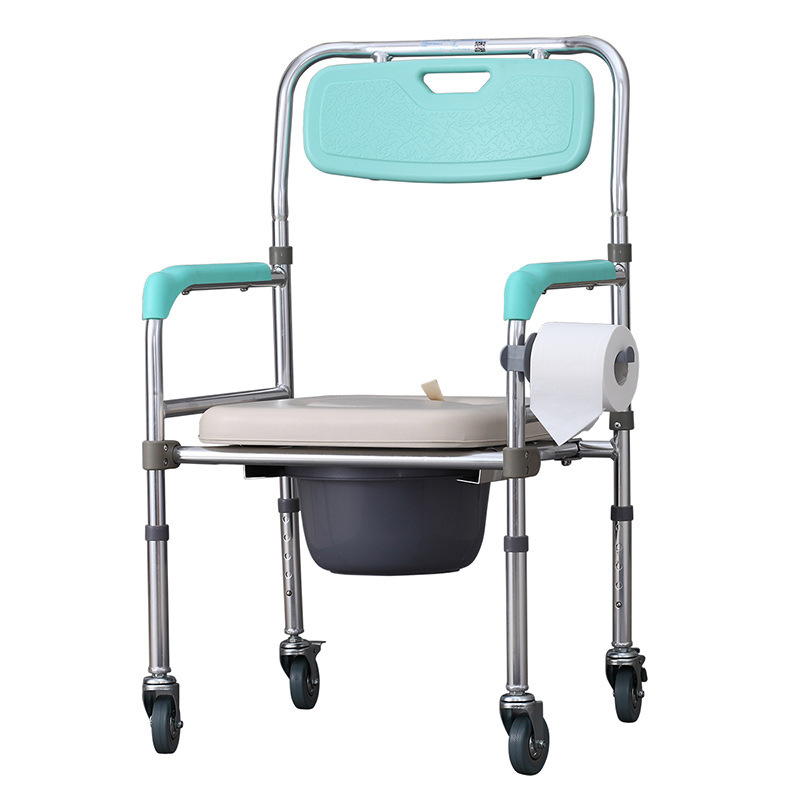 Have you seen a walker that can be used as a toilet like Removable Aluminum alloy Toilet Chair? Take a bath, sit and help the three-in-one walker. Use function analysis: 1. The toilet can be pumped before and after, and can be lifted. 2. Comfortable and user-friendly design, soft armrests and more comfortable arm placement. 3. Curved thick backrest for a more comfortable fit. 4. A reasonable height to solve the troubles of the kneeling. 5. Easy to fold with one button for easy storage. Press the install button and rotate the shelf in the opposite direction. 6. With wheels can be implemented, it is convenient to move patients, and distribution safety is guaranteed. 7. 3-foot silent small wheel, the sound is small, no interruption, and the rear wheel can brake more safely. 8. Reinforced rods have been added on both sides for a more stable implementation.Applicable occasions: 1. Washroom: When the toilet booster is used, the height can be adjusted, and it can be used as a booster on the household porcelain toilet. 2. Bedroom: placed at the edge of the bed, you can get out of the bed to get into the toilet, solve the problem of frequent nights. 3. Ward, public toilets: squat toilets become toilets, solve the problem of squatting, with splash-proof and prevent spillage, straight drains, no leakage of urine.Interpretation of details: 1. EVA backrest widened, comfortable and durable. 2. Memory sponge seat plate, high rebound does not deform. 3. Ergonomic soft leather armrests, PP with non-slip texture. 4. Thickened with lid can be lifted, sealed design, with a bottomless splash bucket. 5. 5 heights can be adjusted to meet different heights, one button adjustable 6. Upgraded non-slip mats, contact surface diameter of 55MM, built-in steel, wear-resistant anti-slip. 3. The commode can be pumped before and after, and can be lifted.